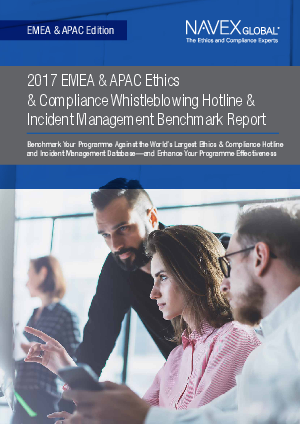 The 2017 EMEA & APAC Whistleblower Hotline Benchmark report was produced with data from companies of all sizes and industries across the region. Use the findings to put your company’s whistleblowing report data in context or gain organisational alignment to start your whistleblower programme. Am I getting too few or too many reports compared to like-sized companies? Is my organisation following up on cases in an appropriate timeframe? How can I more effectively follow-up on anonymous reports?